In PowerPoint, you can apply shadows, reflections, glow effects, soft edges, bevels, and 3-D rotation to a video. Click the video on the slide that you want to add an effect to. Under Video Tools, on the Format tab, in the Video Styles group, click Video Effects. Tip: If you do not see the Video Tools or Format tabs, click the video to make sure that you have selected it. To apply or change a preset combination of effects, point to Preset, and then click the effect that you want. Tip: To customize the preset effect, click 3-D Options, at the bottom of the Preset menu, and then choose the options that you want. To apply or change a shadow, point to Shadow, and then click the shadow that you want. Tip: To customize the shadow, click Shadow Options, at the bottom of the Shadow menu, and then choose the options that you want. To apply or change a reflection, point to Reflection, and then click the option that you want. Tip: To customize the effect, click Reflection Options, at the bottom of the menu, and then choose the options that you want. To apply or change a glow, point to Glow, and then click the glow variation that you want. To customize the glow colors, click More Glow Colors, and then choose the color that you want. 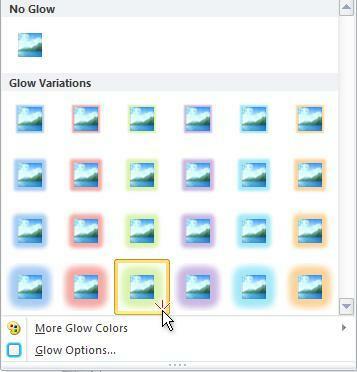 To customize the effect, click Glow Options, and then choose the options that you want. To apply or change a soft edge, point to Soft Edges, and then click the size of the edge that you want. Tip: To customize the effect, click Soft Edges Options, at the bottom of the menu, and then choose the options that you want. To apply or change an edge, point to Bevel, and then click the bevel that you want. Tip: To customize the bevel, click 3-D Options, at the bottom of the menu, and then choose the options that you want. To apply or change a 3-D rotation, point to 3-D Rotation, and then click the rotation that you want. Tip: To customize the rotation, click 3-D Rotation Options, and then choose the options that you want. Tip: To remove an effect that you've added to the video, point to the menu entry for the effect, and then click the No Effect option to remove the effect. For example, to remove a shadow, point to Shadow, and then click No Shadow. 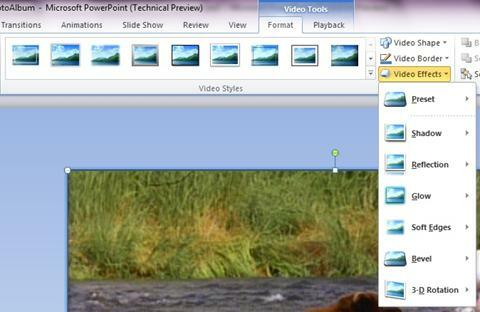 On the Video Format tab, in the Video Styles group, click Video Effects.